Connor's back in to his cars lately. Not sure exactly what sparked it, probably playing with the slot racer cars after we moved in. He's been building a bunch of tracks out of different toys, but he hasn't been very satisfied with any of them and really wanted to drive his cars around on the wood floor downstairs. Our hardwood floor in our KC house didn't fare well with a lot of little cars crashing and scratching it, so we looked online for a car track that would work. There weren't a lot of good options, but we eventually found a really neat car track mat. 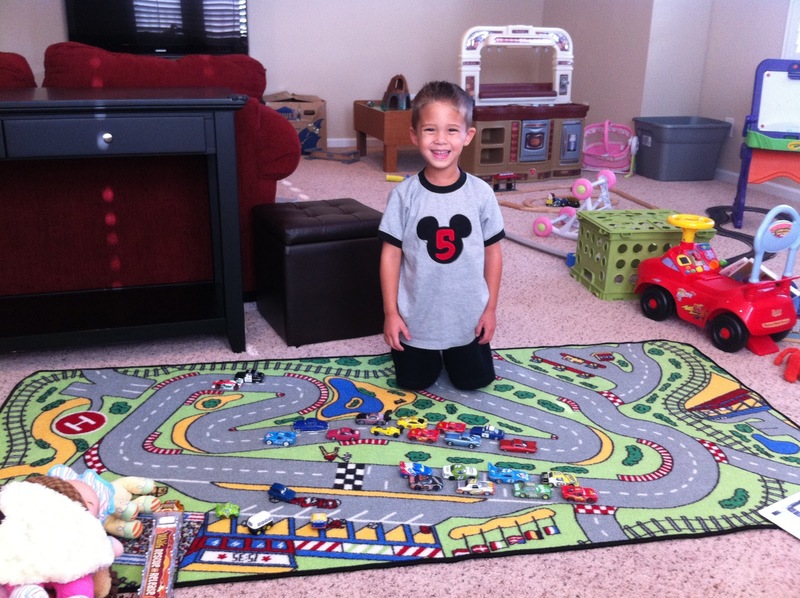 It has a great track that allows his cars to fit perfectly 2-wide and it's a great size too. It took about 4 days to arrive, and Connor wasn't too patient about the wait, but he absolutely loves it. Recently, he likes to watch Youtube videos of other kids talking about their cars and showing their tracks, so I took a little video of him doing the same.